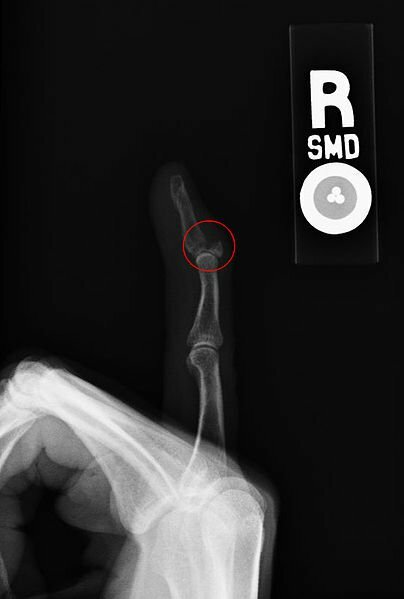 X-Ray of right 5th finger showing an avulsion fracture. Fracture of the finger resulting from street fights, domestic violence, etc. What are the Signs and Symptoms of Finger Fracture? How is Finger Fracture Diagnosed? What are the possible Complications of Finger Fracture? How is Finger Fracture Treated? In most cases, Finger Fractures require surgery, although some may be treated without resorting to any invasive procedures. How can Finger Fracture be Prevented? It is always recommended to be careful and consciously aware, while performing any physical activities such as, sports, or even some normal daily activities that could lead to situations involving accidents. Children must be provided a safe environment to work, study or play; any probable dangers involved should be anticipated and safety measures adopted. Build bone strength: Foods rich in calcium, such as milk, yogurt, and cheese, help build bone strength. A regular diet with an appropriate calcium intake is recommended, even after such injuries. In women, the recommended amount of calcium increases with age and menopause. Calcium supplementation can help build stronger bones and treat calcium deficiency in the body. It is important to mention the healthcare provider the exact circumstances that lead to the injury. This will help the examining healthcare provider to perform all the needed tests to assess the extent of damage. Alexander, H., Langrana, N., Massengill, J. B., & Weiss, A. B. (1981). Development of new methods for phalangeal fracture fixation. Journal of biomechanics, 14(6), 377-387. Bauze, A., & Bain, G. I. (1999). Internal suture for mallet finger fracture.Journal of Hand Surgery (British and European Volume), 24(6), 688-692. Damron, T. A., Engber, W. D., Lange, R. H., McCabe, R., Damron, L. A., Ulm, M., & Vanderby, R. (1993). Biomechanical analysis of mallet finger fracture fixation techniques. The Journal of hand surgery, 18(4), 600-607. Harken, D. E., Dexter, L., Ellis, L. B., Farrand, R. E., & Dickson III, J. F. (1951). The surgery of mitral stenosis: III. finger-fracture valvuloplasty. Annals of surgery, 134(4), 722. Kung, W. M., & Lin, M. S. (2012). A simplified technique for polymethyl methacrylate cranioplasty: combined cotton stacking and finger fracture method. Brain Injury, 26(13-14), 1737-1742. Hart, R. G., Kleinert, H. E., & Lyons, K. (2005). The Kleinert modified dorsal finger splint for mallet finger fracture. The American journal of emergency medicine, 23(2), 145-148. Monasterio, M., Longsworth, K. A., & Viegas, S. (2015). Use of a bivalve finger fracture orthosis for a new treatment protocol of a PIP comminuted fracture and dorsal dislocation. Journal of Hand Therapy, 28(1), 77-81. O'brien, L., & Presnell, S. (2010). Patient experience of distraction splinting for complex finger fracture dislocations. Journal of Hand therapy, 23(3), 249-260.